As part of protests being held across India, several Dalit rights activists gathered in Ahmedabad to show solidarity in support of Prof Anand Teltumde, sought to be persecuted allegedly on "frivolous and unsubstantiated" charges, such as he sympathizes with Maoists, that he helped provoke violence at Bhima Koregaon early last year, and that he planned a 'Rajiv Gandhi like assassination' of Prime Minister Narendra Modi. 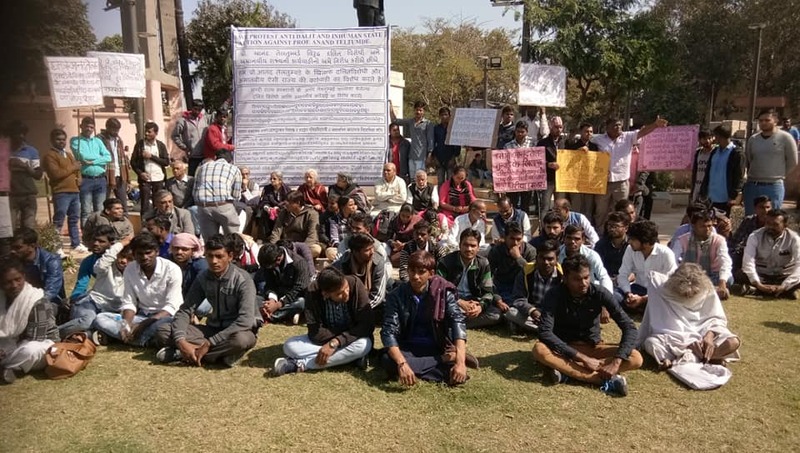 The protesters believed that it was part of the effort of the BJP rulers to silence dissent, pointing out that Prof Teltumde was born to a Dalit peasant family in Vidarbha, studied at IIM- Ahmedabad and furthered his career as MD of BPCL and CEO of Petronet India. He taught at IIT Kharagpur and at present has been at Goa Institute of management. A prolific writer, Prof Teltumde has written extensively on the subject of caste. A note circulated by top Gujarat Dalit rights leader Martin Macwan said, The Supreme Court of India had given him protection until February 11 against arrest and seek pre-arrest bail. The Pune did not grant him bail. After his arrest, the Pune Court cancelled his arrest as 'illegal' and as an act of contempt to Supreme Court order.